Gnocchi—those mysterious little pillows that are cousins to pasta—are light and airy when made correctly. But what exactly are they? 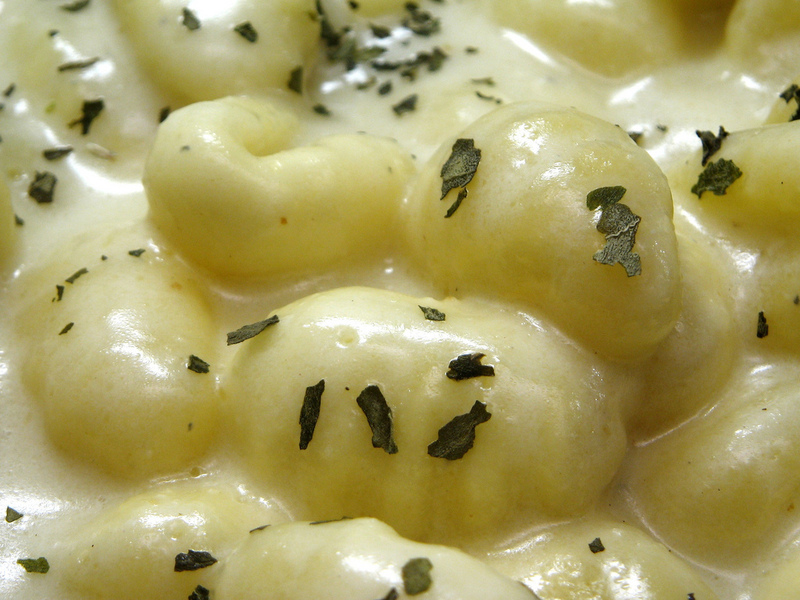 Gnocchi are small dumplings. In Italian, the word gnocco translates to English as "lump". The most common gnocchi are made of potatoes mixed with flour, though they can also be made using squash, ricotta cheese or even polenta. Gnocchi is served the same way as pasta with tomato, cream, or sage-butter sauce topped with fresh grated parmesan cheese. Gnocchi recipes date back to the twelfth century and are most common in the Northern regions of Italy. Since gnocchi consist of "dumplings" and don’t need any special skill or technique to flatten or cut, they are possibly even older than pasta. The ridges common on gnocchi are one way to shape them; other recipes do not require it. They came about to aid in sauce retention only. If you want gnocchi take some cheese and mash it, then take some flour and mix it with egg yolks as if you are making dough. Place a pot of water over a fire. When it starts boiling, place the mixture on a board and slide it in the pot with a spoon. When they are cooked, place them on plates and top them with a lot of grated cheese. I have to admit that although gnocchi are easy to shape, making fluffy gnocchi is an entirely different matter. If you’ve made pasta, you know the consistency of the dough. It’s rather stiff and takes some work to roll out. Gnocchi is the opposite. Care must be taken to not use too much flour. You want to not overwork the dough, and add only enough flour to make a soft smooth mass that can be shaped. Too much four makes them tough. There is one special tool that can help shape your gnocchi. 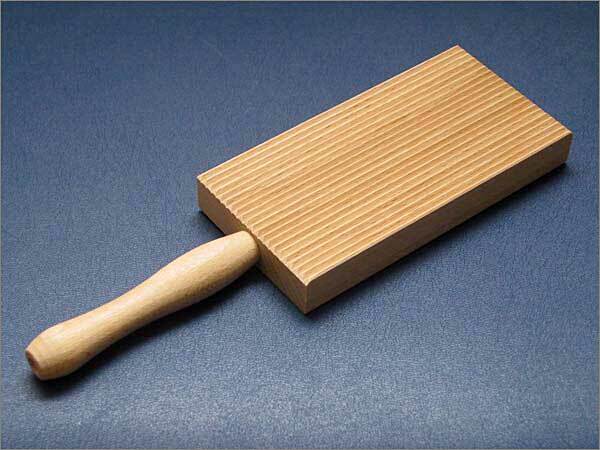 It’s called a gnocchi board. It’s a small grooved board that you push the gnocchi pieces over to give the characteristic ridges that help hold the sauce. They are available at most Italian gourmet shops. The following video shows you how to shape the gnocchi, using both the board and the tines of a fork, which is a common solution. There are two methods for preparing the potatoes: boiling or baking. Baking reduces the amount of moisture, which requires less flour to make the dough. This helps keep the gnocchi light. Either way, prepare the potatoes until cooked through. If baking, leave skins on; if boiling remove skins. Push the cooked potato through a ricer. This also can be done with a masher and fork. Keep in mind the ricer is used to remove all the lumps from the potato, so either way they have to be smooth. While still warm, place the riced potato in a bowl. Make a hollow in the centre, add the yolk and incorporate into the potato. Begin adding flour and mixing. Add only enough flour to make a smooth, workable dough. Using about 1/2 cup at a time, roll the dough on a very lightly floured board, into a log about the thickens of your thumb. Repeat with remaining dough. Cut each log into 1” (2.5 cm) pieces. 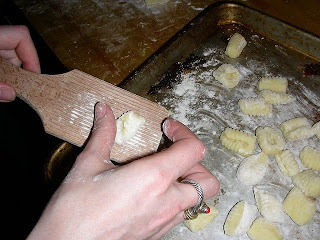 Using your thumb in the centre of each piece, press the dough onto the gnocchi board (or fork) to make the ridges. Use immediately, or store in the refrigerator for at most 3 hours. Make the sauce before cooking the gnocchi. Combine the gorgonzola, cream, basil and pepper in a saucepan. Heat until well combined. Keep warm. To cook the gnocchi, bring salted water to a boil in a large saucepan. 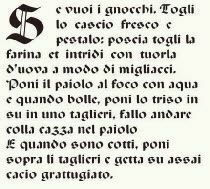 Drop the gnocchi into the water and cook until they float. This should take no more than 3 minutes. Serve with the sauce and grated parmesan. In general, according to the culture, was gnocchi stereotypically made by the female or male family member? Was there a custom for making it, for instance did the son or the father always make it, was it just a normal food made by the woman of the house? One would assume since cooking (until recently) fell into the domain of looking after the house and family which was done by wives/mothers it was a female activity. It certainly wasn't made only for any particular special occasion which would require a specific individual. In fact making gnocchi has been noted in Italy since Roman times. I would bet money, based on their patriarchal society that men didn't enter the kitchen very often. But of course I can't be sure.